I love hearing about how other people came up with their 365 pictures, photo shoots, just about anything really! So here's the story behind one of mine. Today is an exceptionally grey day. It feels like summer is long gone. I heard the rain and my heart sank. I wanted to take a pretty 365 today - I wanted to go outside, take a walk, catch the light. Wasn't going to happen. I thought perhaps maybe I could take a picture of the rain on the window, I hadn't taken one like that before. I got upstairs with my camera and I was disappointed. No lovely raindrops on the window - just grey skies and flat colours. That was the end of that idea then. And then I thought, sometimes you just have to make something happen. So I got a cup of water from the kitchen and I threw it on the window. 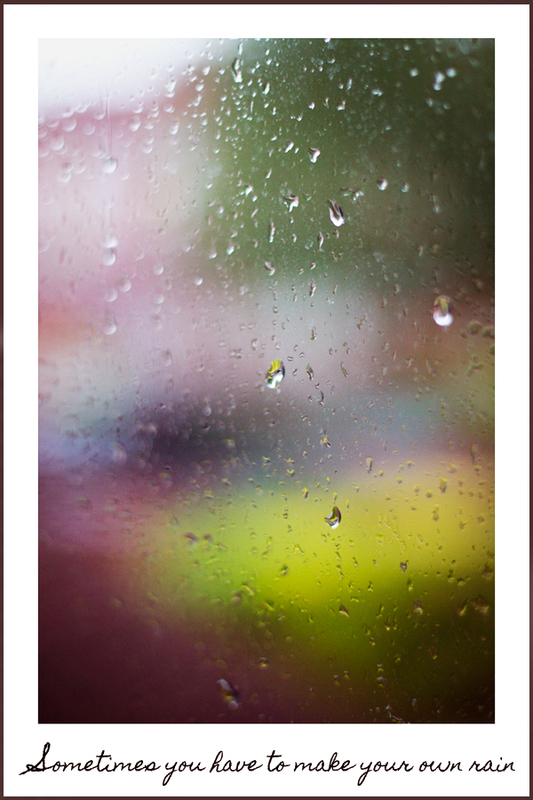 Pretty raindrops manufactured by Rachel Tweeddale Photography. Have you got any stories of making something happen in order to get the picture you wanted?